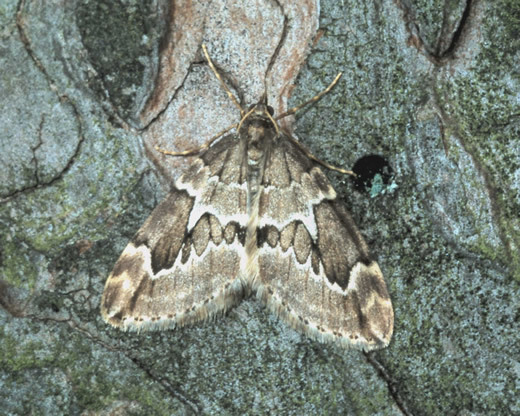 This is a monthly series illustrating several characteristic moths to look out for in our area. Text and photos by Roy Leverton. You can also view the other months by selecting the links at the bottom of this page. 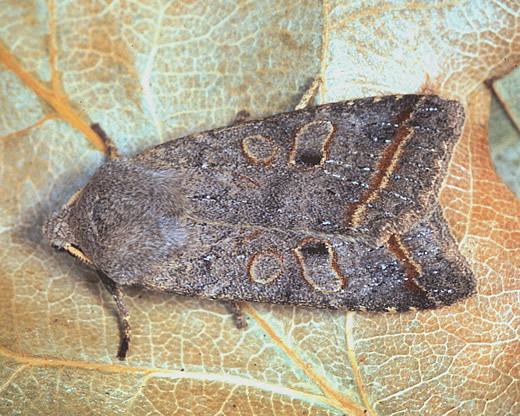 Though not closely related to the spring quakers Orthosia, this and the following species share the same drab colours and plain appearance that evoked the common name. 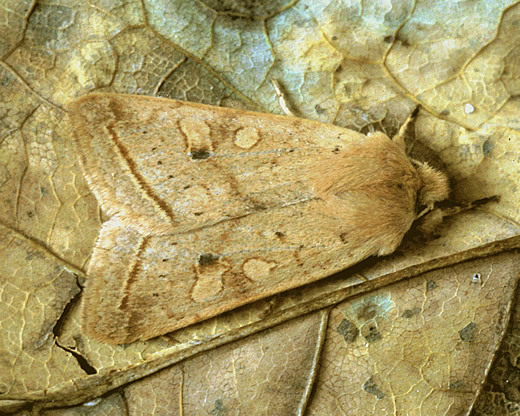 The caterpillars of both groups feed on fresh spring foliage - sallow in the case of Red-line Quaker. So in the autumn species it is the egg that overwinters, ready to hatch as soon as the buds burst. In a black and white photograph this species would be hard to distinguish from the previous one, so similar are the shape and markings. Fortunately the ground colours of the two never overlap. Its larval foodplants include many deciduous trees and also heather. The adult moth feeds on ripe blackberries and also ivy bloom, one of the few late nectar sources. 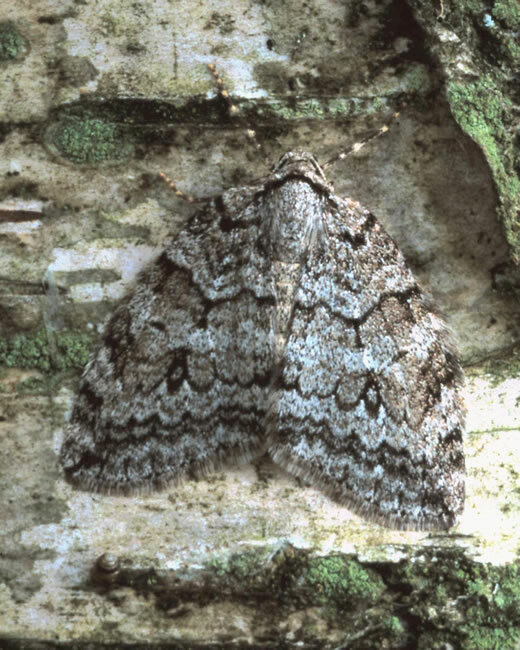 This carpet moth is so atypical of its subfamily in wingshape, resting posture and the longitudinal markings that it was originally described as a tineid, as the -ella termination shows. 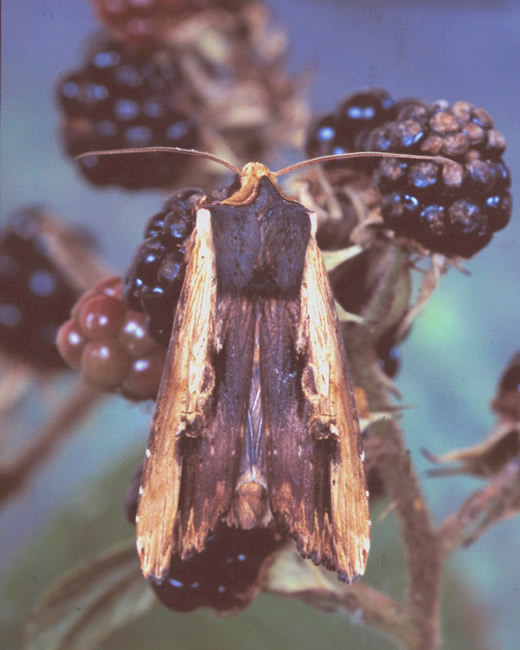 Broom is its only foodplant and the moth occurs almost everywhere this grows, though is rarely seen except at light. Almost any month, but mainly in late autumn. Given favourable southerly winds, this small migrant pyralid reaches our area in most years, often in company with the Rush Veneer (see Moths of November and December). 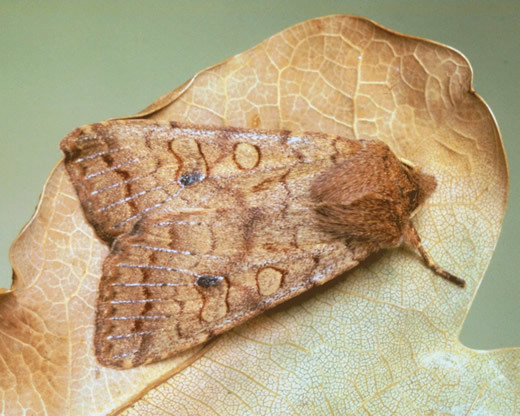 Its distinctive arrowhead shape and rusty-brown colouring make it easy to identify, whether on a lighted window after dark or if disturbed from herbage in the daytime. Roadsides, wasteland, field edges, other weedy places. In the northern half of Scotland this is very much an eastern species, absent from the wetter though milder west. Its caterpillars lives within the stems of tall weeds such as thistles, feeding on the pith and later pupating within the hollowed-out stem. 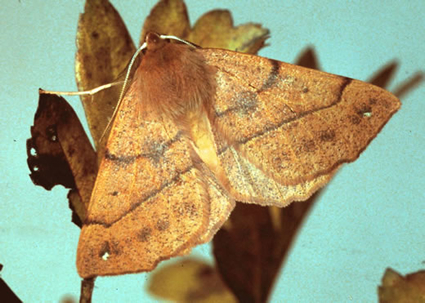 Since the adult moth cannot feed it is not attracted to flowers, but it regularly comes to lighted windows after dark. This attractive moth is always a welcome find. It is widespread wherever there is hawthorn or rowan, but never numerous enough to become commonplace. The dusting of almost metallic green scales on brown wings perhaps mimics algal growth on damp autumn tree bark. Almost anywhere with long-established junipers, including gardens. 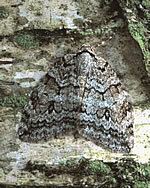 This small grey moth is often overlooked because of its late flight season and rather sedentary habits. Adults spend most of their time sitting around on juniper bushes, where they can be found by torchlight. 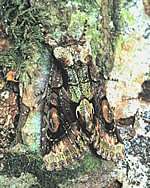 Otherwise the moth is rarely seen, though caterpillars can be tapped from their foodplant in large numbers during July. September and October, then hibernating until spring. Moorlands, marshes, other open country. There are few nectar sources in late autumn, so ripe blackberries provide an alternative food for many moths at this season. 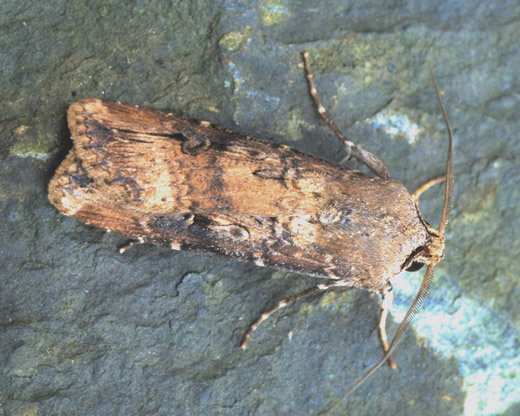 Torchlight searches of the brambles on suitably mild nights may reveal a range of species including Red Sword-grass, now with wings partly opened instead of in the tightly furled resting posture (see March). 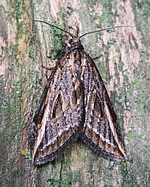 Migrant, most numerous in autumn. Long narrow wings and long legs distinguish this annual visitor to our area, usually in small numbers. Despite its vernacular name it is not closely related to our resident sword-grasses. 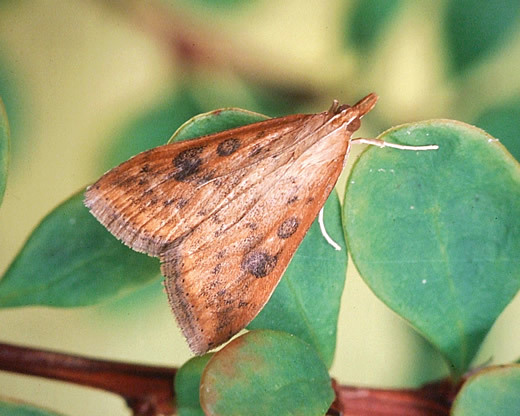 It is, however, in the same genus as the notorious Bogong Moth of Australia, A. infusa, whose migrating swarms sometimes disrupt traffic and allegedly provide food for Aborigines. Late August to early November. 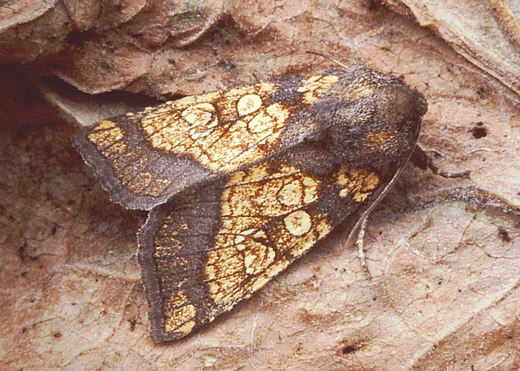 Presumably named for its terracotta colour, the Brick is one of the most reliable autumn species at sugar or ripe blackberries, though less frequently seen at light. 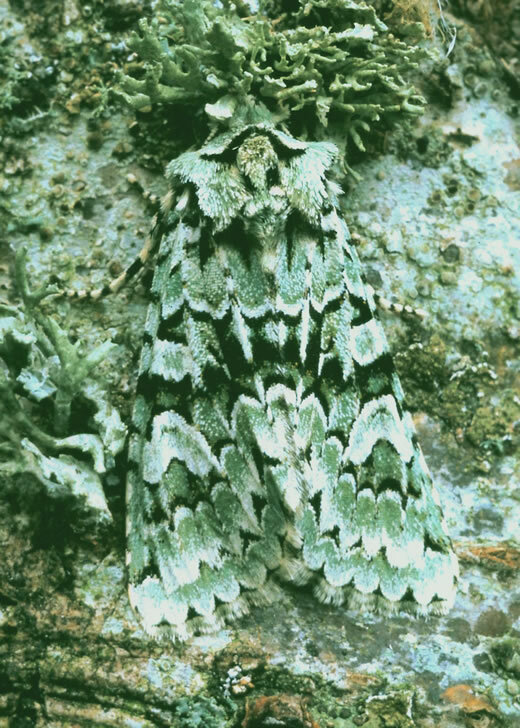 The eggs overwinter because its caterpillar feeds on the inflorescence and developing seeds of deciduous trees such as sallow, poplar, wych elm and ash. The caterpillars grow quickly on this nutritious diet, leaving them with surplus time to kill, spent lying in the cocoon for many weeks before pupation. Flies from October into November. Especially common in birch woodland. More silvery grey than the other species in this tricky group, and also the last to emerge. Occurs in deciduous woodland, parkland and towns. An unmistakeable species with its russet autumn colouring, though rather local in our area. Late September into November, then again in Spring. Inhabits farmland, wasteland and open country. 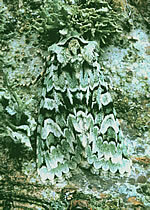 The caterpillar of this shaggy, rough-scaled moth lives in the rootstock of hogweed and angelica. Unusually for a hibernating species, the adult cannot feed. 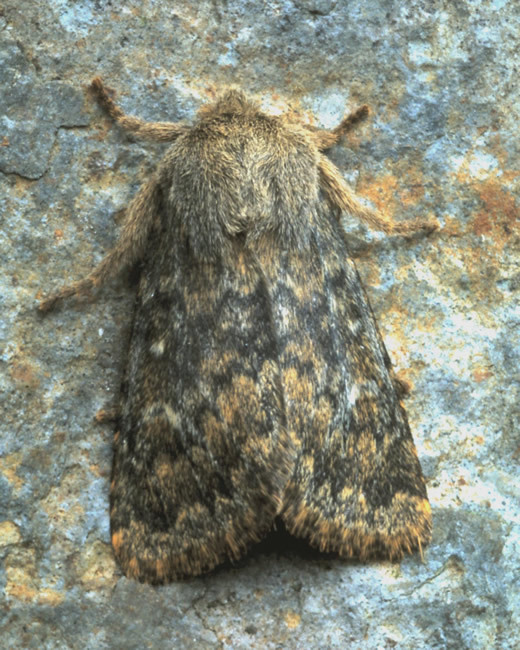 Only mated females survive the winter. Woodland and parkland with oaks. 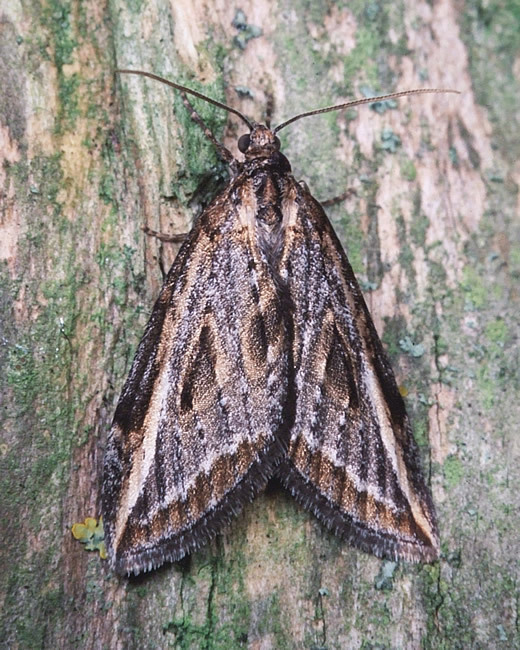 Not all autumn moths are orange or yellow. This splendid species rests on mossy and lichened tree trunks, greener now than in the summer. 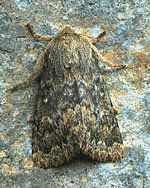 May be found all year round, but most numerous in autumn when augmented by migration. Arable farmland, towns and gardens. With its unique crinkled resting posture, this distinctive species is easily recognised. 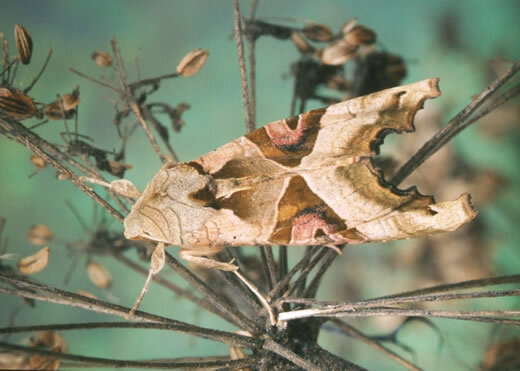 It sits openly, often on withered vegetation, trusting in its camouflage.